National Dairy Shrine will be celebrating 70 years in 2019 and what a tribute becoming 20,000 Lifetime Members strong would be. Yes, that’s right, with a bit of effort on our part we could reach a lifetime membership listing of 20,000 by 2020! What an exciting goal to set before us, one that each of us can contribute towards making happen. Setting goals is the role of a President and I have often reflected on what those should be for the coming year. Spending the first week of October in Madison, Wisconsin brought back many memories of my involvement with National Dairy Shrine. After attending the Judging Contest awards banquet on Monday night I thought back to my judging team days and when I was sponsored as a new NDS lifetime member. Seeing the excitement of those young people was contagious. Then attending the NDS awards Banquet and again seeing such wonderful students receiving scholarships full of enthusiasm for the dairy industry. The pride of their family and friends and hope for their future was heart-warming, as was seeing the adult honorees reminisce about their role in the history of the dairy industry. This blend of youthful exuberance mirrored with lifetime achievements left me with the impression of what a great organization NDS is. That diverse set of recognition winners matches the membership of National Dairy Shrine. There are numerous members who like myself who were freely given memberships years ago and now are thinking of ways to give back to the industry we love, while the majority of new NDS members are just starting with their life’s journey. I can tell you the National Dairy Shrine Board has spent many hours addressing the best methods NDS can use to address the needs of our growingly diverse membership. I believe that the best and brightest new generation of dairy leaders should be members of National Dairy Shrine at the start of their careers. Recently NDS has developed avenues to reach their younger membership with an active social media presence on Face Book, developing a new ad campaign to reflect the young dairy professional and redesigning the NDS website to be more accessible for smart phone device users. This Chronicle newsletter informs everyone about the latest achievements of past and future dairy leaders. I would also like to report that the NDS board has also authorized committees to address additional ways that NDS can impact the dairy industry. 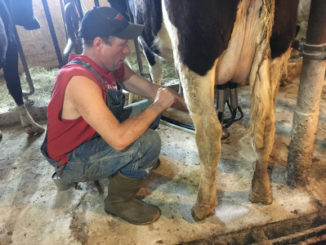 First NDS is looking for ways to get members who are graduates of college dairy programs to help sponsor graduating seniors from their school with Dairy Shrine memberships as a way to aid in their finances and recognize the potential of these students. Alumni at the University of Minnesota, Iowa State University and Cal Poly already have a NDS sponsorship system in place. How about getting together with your former classmates and making something happen at your Alma Mater? Secondly the young producer awards have seen a drop in applications and the board has started an initiative to enliven this recognition and make it more meaningful to younger dairymen. Encouraging today’s young dairy producers has to be a goal and we have a newly formed committee dedicated to this goal. 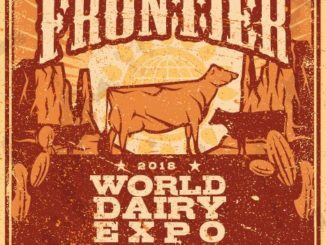 Thirdly because of our beautiful booth location provided by World Dairy Expo on the second level of Barn Pavilion 1 we now have a location, to offer a quiet, relaxing space for reminiscing, gathering and visiting. What a great place for some of our older members to meet their friends. Also in recognition of the students, we are planning a pre-banquet reception for next year in our booth area for our scholarship winners. This year National Dairy Shrine honored 40 students from across the country with scholarships and along with our partner the Klussendorf Association provided over $60,000 to this emerging generation of the future. Lastly our 70th anniversary banquet will have some special touches for our scholarship recipients, honorees, members and guests. So here’s my challenge to us all, it’s 20,000 twice. Reaching 20,000 NDS lifetime members by 2020 and raising an additional $20,000 in funding for this year before 2020. A board committee is already working on making this fund raising goal a reality. A 20,000 member organization can have impressive influence. Since we have young and old members in a wide diversity of dairy occupations we can make positive things happen. However we need to continually reach out to additional segments within our Industry to insure our future. I cannot say it any better than that. I believe that with our talented group of NDS board members, a dedicated Executive Director, hundreds of loyal volunteer members and the help of dairy industry companies the goals of 20,000 by 2020 are attainable.